If you are upgrading or modernizing a legacy system to ensure the highest level of productivity and safety, to the installation of a brand new, state-of-the-art unit, Han-Tek can handle it. Our ISO 9000 certified process ensures your project will be done right, on-time, and on-budget. There is almost nothing our team of engineers cannot do or have not done. Han-Tek training, service, and support ensures you’ll be up and running in no time, with the goal of no downtime. Cranes are often an after-thought… but they shouldn’t be. 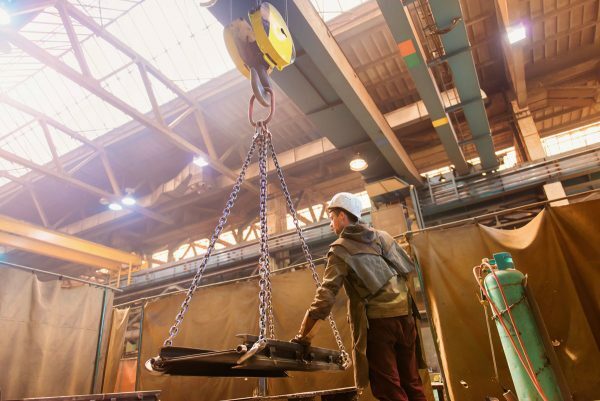 Vendors offering out-of-the-box solutions often force you to compromise on your unique requirements in order to get a crane quickly. At Han-Tek, we don’t want you to compromise. We want you to be confident that Han-Tek can provide design, build, installation, load testing, and commissioning of crane system – whether it’s a modernization or upgrade of your existing system, or an entirely new materials handling system. Han-Tek maintains in-house management, design, fabrication, riggers, and installers that work together to ensure your crane system is completed quickly and efficiently from start to finish – according to your exact specifications. And we’ll stay with you through every phase of the project, ensuring that everything is done to your highest standards. Han-Tek works closely with the industry’s leading suppliers—our strategic partners—to specify the right components and machine controls and then integrate them with your manufacturing or handling systems. But we don’t stop there. From project management to mechanical and electrical engineering, from computer simulation to fabrication, from installation to service and training, our goal is simple: do whatever it takes to maximize your productivity, reduce bottlenecks, cut costs, and improve worker safety. Contact Han-Tek to learn how we can help you upgrade or modernize your legacy system or install a new crane and hoist system. Whatever the situation, Han-Tek can help you modernize or upgrade your equipment to like-new standards to ensure the highest level of performance and safety. We can boost your crane’s power and control systems to improve its flexibility and functionality. Han-Tek can also recondition or rebuild virtually any system component, from tracks to spans, gantries to hoists. Once we understand your situation, We do it all in-house to ISO standards, which ensures the highest level of quality and the fastest delivery. Han-Tek top-running single- and double-girder girder cranes with very low headroom are the smart choice for unlimited spans and capacities. They are extremely versatile, allowing for higher capacity and a wide range of special equipment and service access, for larger spans and capacities. 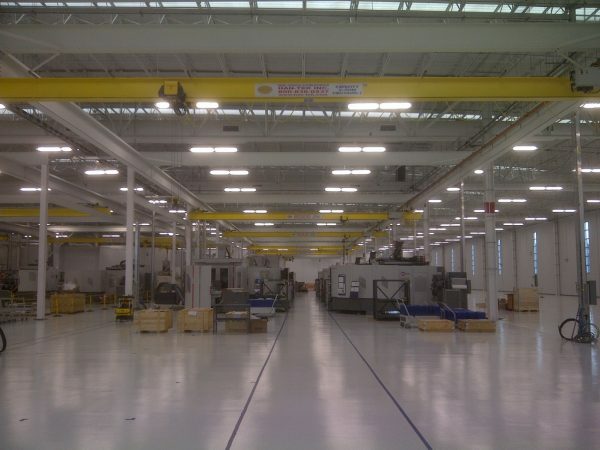 Han-Tek under-running cranes offer a combination of close headroom and side approach options, and in many cases can be hung from the existing building structure. 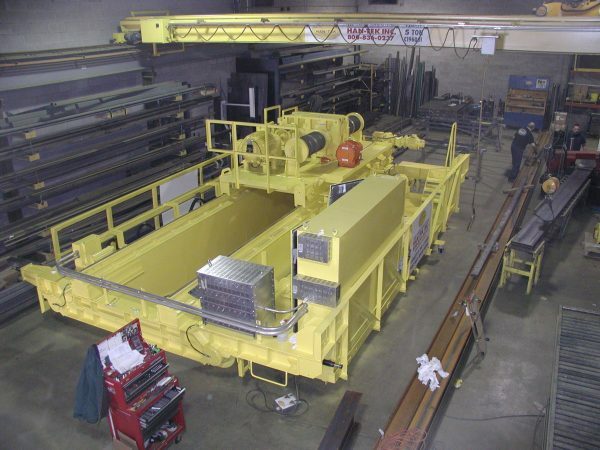 For longer spans, Han-Tek also offers double- girder cranes. Free-standing and interlocking systems also available. 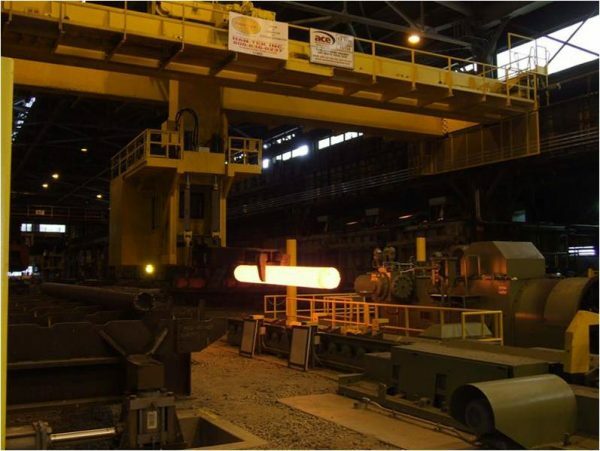 Han-Tek has specialized in the loading and unloading of large and unwieldly high-temperature furnaces, with temperatures of well over 1,000 degrees in the processing of specialty metals. Products loaded into these furnaces are often very large and unwieldy. In this case, standard, off-the-shelf cranes and hoists just will not work. Han-Tek has more than a decade of experience in the design, engineering, installation, training, and service of cranes for this highly specialized market. In production environments, employee health and safety is critical. Han-Tek can analyze your workflow and design a worker-friendly system to help improve safety, efficiency, practicality, and cost effectiveness. Han-Tek can recommend a portfolio of ergonomic materials handling devices that will help improve workplace performance and productivity – utilizing electronic or pneumatic balancing systems, vacuum lifting, or enclosed-track crane systems to carry the loads. Mechanical grippers and lift-and-tilt tables can also be integrated to minimize repetitive-motion injuries. We know how costly equipment downtime can be. Han-Tek provides 24/7 emergency and preventive maintenance service to keep you up and running. 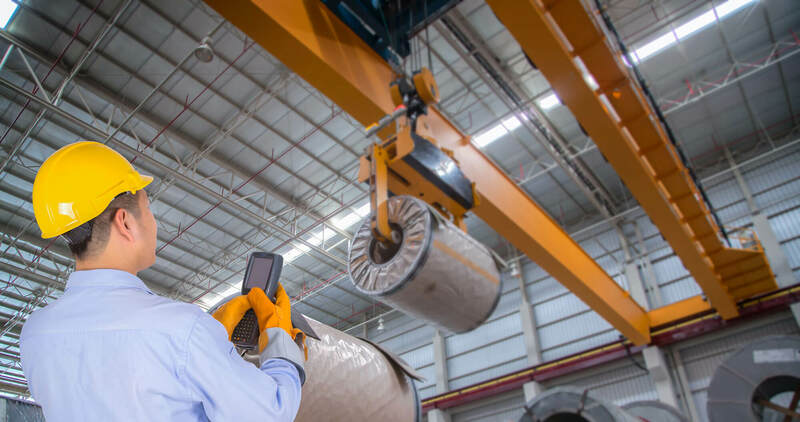 Our factory trained, OSHA-certified field-service technicians bring you a comprehensive range of services that will keep your materials handling systems – cranes and hoists – operating at peak performance. Han-Tek can support equipment relocation, modification, and upgrade; preventive maintenance programs; personnel training; access to our full-service parts department; and more. 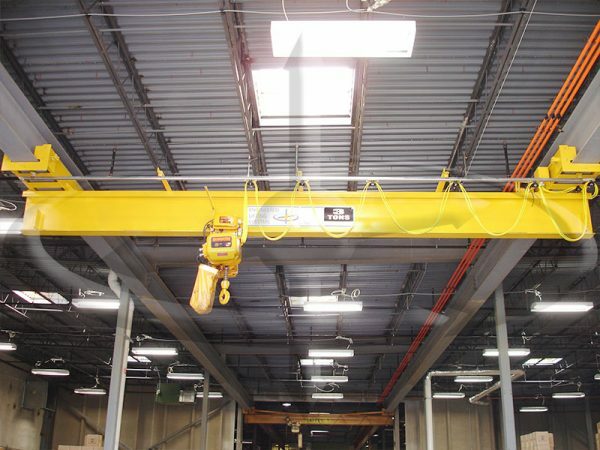 When you design a new building, or are planning an addition or upgrade to an existing building, it’s easy to overlook the crane system. Too often, buildings are being completed before final design and installation processes of cranes are determined. Early communication and coordination can save you in the long run. 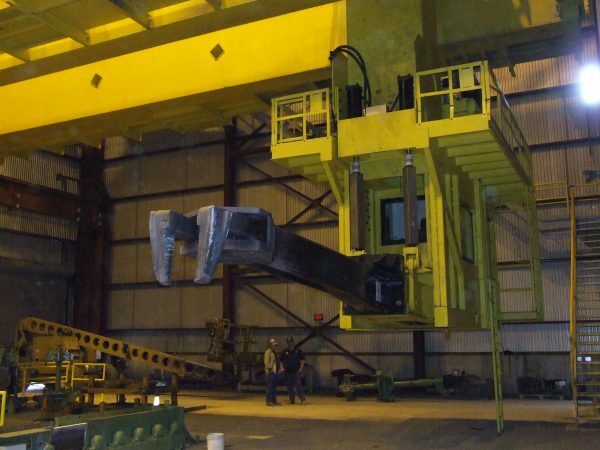 If you have a low ceiling, and you are concerned that you cannot obtain a sufficient hook height, Han-Tek can design a bridge crane that can get the job done. No one can get the hook higher than Han-Tek. Han-Tek’s bridge cranes come with Variable Frequency Drive (VFD) control for all motions, which gives operators the pinpoint control necessary to move large, heavy, yet extremely delicate parts with more ease and eliminate defects or damage to parts. And because Han-Tek cranes come with collision avoidance, you need not worry about operator reaction time to prevent accidents. Han-Tek’s ISO procedures require checklists to be completed throughout the entire crane project, so that cranes are complete and ready to go when they’re being put on the truck and shipped out to your facility. ISO procedures eliminate time that would be needed for modifying and debugging the crane in the field during and after installation. At Han-Tek, we analyze your specific needs and only then recommend a solution right for you. One that ensures the safest, most cost efficient, and best process of lifting and moving your product.